Every day on the way to work, I ride up Burns Bay Road. It’s the place I get the most close passes. In part this is because of the layout; the council have in their wisdom decided to stencil bike symbols in the parking area, right in the door zone. Needless to say, I don’t ride in the door zone. If you want to know why, click here. However, this one was rather unexpected. Not very close, but definitely inside one metre (the legal minimum), and not very comfortable. And it was a police car. What to do? 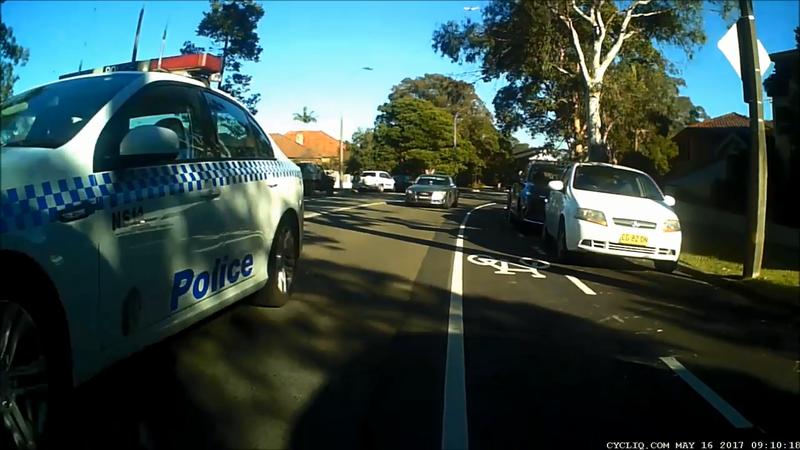 I asked my friends at SydneyCyclist, and subsequently went into the police station to complain. It was interesting. For one thing, when I mentioned that car involved was a police vehicle, I immediately got the Duty Sergeant, rather than the usual constable. He took the still images I had taken from the footage, but oddly declined to take the video file. A day or so later, I got a call from the officer in charge of the traffic division. He went through the scenario with me, and was sympathetic, although I did have to educate him on the difference between bike route symbols (the painted bike symbols, which have no legal standing), and a Bike Lane, which is defined in the Australian Road Rules (and which Burns Bay Road does not have). I would have hoped a senior traffic cop would have known the difference, especially as it has legal implications as to where you should ride your bike. He ultimately apologised, and asked me what action I wanted. I was happy with an apology and the driver being spoken to about his obligations around cyclists, although some of my cycling friends were not impressed that the cops did not charge the driver with the offence. (You can see the video footage here). Another book plucked from the shelf. So many good books on my shelves waiting to be read! 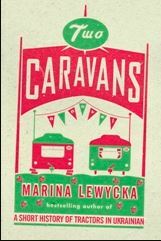 This is Marina Lewycka’s second novel, and follows the fortunes of a group of itinerant workers who have come to England to pick strawberries. There is a memorable and hilarious cast of characters, from the shady Farmer Leapish who houses the workers in two broken-down caravans in his field to the naive nineteen year old Irina, fresh from Ukraine and hoping both to make a living and find a handsome English man like to match the dashing Mr Brown from her ‘Let’s Talk English’ textbook. Whilst a highly comedic novel, it does shed an uncomfortable light on the conditions endured by such migrant workers, as well as the lack of security and risk of being trafficked they face. The use of language is sublime, with the various characters somewhat broken English adding to the atmosphere; for example the hard ‘mobilfonmen‘ who control the workers, and the sinister Vulk, who calls Irina ‘little flovver‘ as he kidnaps her with nefarious intent. The first half of the book has a wide ensemble of characters, and follows them as they move around the country (driven away from Leapish’s farm when his wife runs him over in her sports car after finding out he has an ‘arrangement’ with Yola, the Polish supervisor). Along the way they acquire a dog (called Dog), and the pace and humour in this part of the book make for a rattling read. About half way through, most of the characters disappear, and the book becomes a love story between Irina and Andiry, as they attempt to find stability and peace whilst pursued by Vulk. This part of the novel is less successful, to my mind, and it becomes more forced. Still, it’s a fun book to read that I recommend. And one that will certainly open your eyes to the conditions endured by the immigrant underclass who make up much of the low-paid workforce. As you may remember, over the New Year period we went to the UK, and had a very successful experience with a Burley tagalong trailer. The kids loved it, and it was very easy to ride with it on the bike. I’ve been thinking about getting one for use at home ever since, especially as the children are really now too big for the ‘two passenger‘ solution I had – their increased weight coupled with the high centre of gravity was making putting them both into the kiddie seats a tiring proposition. If I could put the tagalong on the back of the rack, and leave enough space for another child to sit straddling the rack at the front, I’d have a more manageable solution. The issue was how to attach it to the bike. I pondered this for a while, whilst doing some internet investigations. 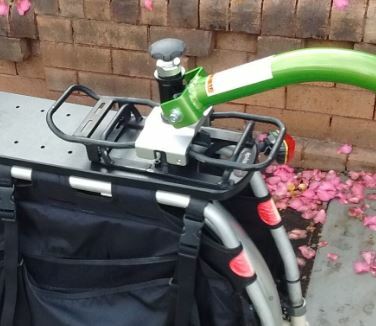 And I found a few people who had successfully fashioned a bracket to attached a Burley trailer to an Xtracycle. I reached out to those people, but the information I found was rather old and I couldn’t track them down. But, after some consideration, I figured that I could probably work something out locally. And if not, I’d just have to buy a new bike suitable to fit the Burley to. 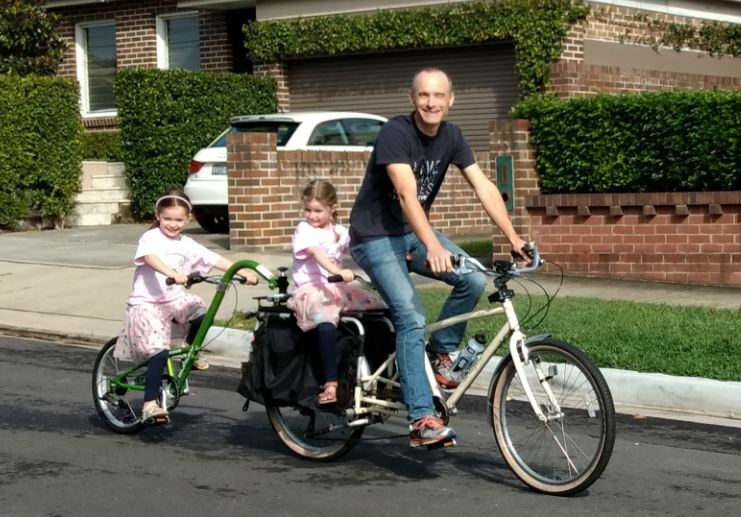 So I bought a Burley Piccolo trailer, which duly arrived. The next step was to find someone who could convert the Burley rack into something I could attach to the Radish. The Burley rack as it comes is a well-built steel rack, which fits in the conventional way over the back wheel of a bike. I needed someone who could take the top part of the rack, and fabricate some kind of bracket so I could bolt it down to the rear deck of the Radish. Luckily I had the adapter brackets for the kids seats as a kind of template. After a bit of ringing around, I found the inestimable Matt Hopkins, of Hopkins Welding. 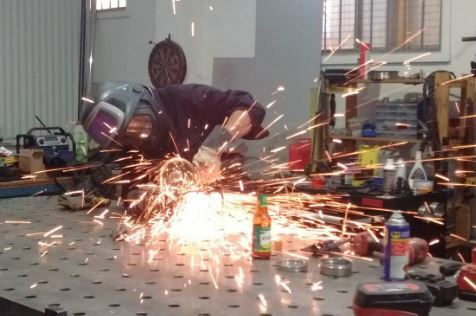 He gamely agreed to have a go at the job, and duly set to with this metalworking tools and welding gear. I can share a short lesson here if you are every thinking of doing something similar. Don’t simply take the part you need modified to your chosen artisan, along with a rather vague description of what you need. Yes, that’s right; version 1.0 was not quite right. I hadn’t taken the whole hitch mechanism along, so Matt couldn’t see that he needed to avoid some parts of the frame when fabricating brackets, where the hitch slots over them. However, when I subsequently took along the whole thing, he was quickly able to modify it to version 1.1, which worked perfectly. I have to say Matt was very patient with me over what was undoubtedly a much more fiddly job that he at first had imagined, and is a thoroughly nice bloke. The other requirement was for something for the child sitting on the rack to hold on to. A bit more internet investigation revealed solutions for this too; with an extra long stem, some small handlebars and the correct shim I was easily able to fit some stoker bars behind my saddle, making for a secure ride for the child sitting on the back. So, with everything fitted it was time for our first ride. We scooted around the block a few times, with the kids swapping places on the tag-a-long and the rack. And it was a great success. The kids love it, and it’s much easier for me to ride; the lower centre of gravity and less weight on the rack makes the bike much more stable. I can also finally do away with the faff of straps and kids seats. I’m on the lookout for a cushion and some Edgerunners for the Radish, to finish off the job, but for now it works fine as it is. 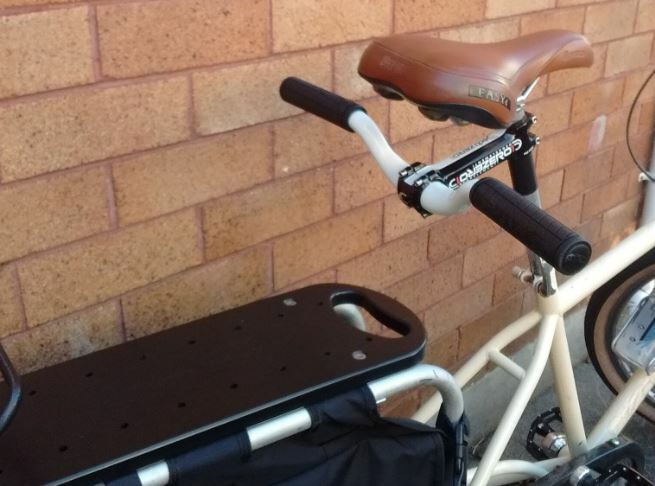 The dual-kid transport solution is back in action! Sorry it’s taken a while to get to this. It’s another of the gelato-inspired flavours, with packaging to match the others. Except that this one is not co-branded as ‘Messina’; it looks like the same range, but lacks the endorsement of the posh-ice-cream-shop-du-jour. There’s a reason for this. It’s not actually inspired by gelato at all. It’s actually inspired by a 2011-era Tim Tam, called ‘Tim Tam Black Forest‘. Yep, that’s right. It’s exactly the same biscuit. 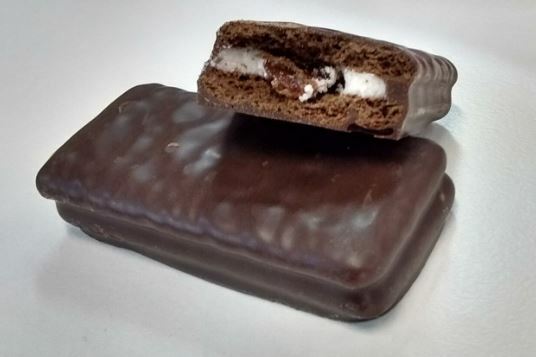 Same filling, same chocolate, same chewy centre. And I have absolutely nothing more to say about it. Read the other review, or just note that it’s not that good, and gets a six out of ten. With the junior Chillikebab’s now at school, we have the joy of school readers. Books they bring home to read to us – full of the joy of them learning to read, and the crushing monotony of the repetitive sentences. 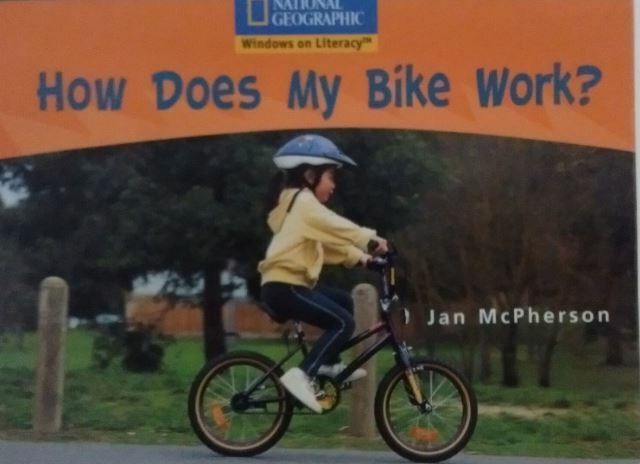 The other day, one of the juniors brought home this one – ‘How does my bike work?’. This book I of course approved of. 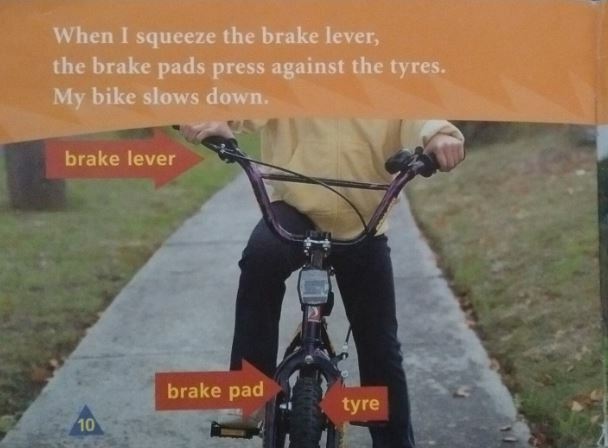 Nothing like some good early education about bike maintenance. Junior read it with aplomb, and I ticked it off on her reading list. Still, it’s always exciting to write a post that I can categorise in both Books and Bicycles! My youngest daughter has, for many years, been an absolute natural on a balance bike. Since she was two years old she’s been scooting along, balancing with ease and maneuvering like a pro. However, the transition to a bike with pedals has taken longer than expected. Despite the fact that she can scoot along on a tiny balance bike (long outgrown), lift up her feet and pretend to pedal, for some reason the idea of actually riding a pedal bike just sent her into meltdown. She’s had a ‘real bike’ for nearly a year, but for the most part it’s stayed in the shed, with the ever-more-unsuitably-small balance bike being chosen instead. Anyway, we finally had a breakthrough. I took her, and her bike, to the park for the umpteeth time, and we tried again. And it clicked. And, of course, she could just ride it – it was purely a confidence thing. She also easily got the hang of braking, able to gently stop when required and put her feet down. She’s been riding it ever since, and hasn’t yet fallen off. So now she is off. A bike rider. I’m planning to go out for a ride with her soon. Maybe we’ll go and buy ice cream.